Mar 19 Comments Off on Taking years off your eyes. Taking years off your eyes. The area around our eyes often reveals the first sign of ageing. 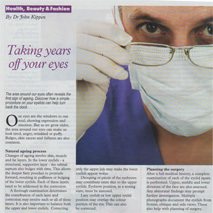 Discover how a simple procedure on your eyelids can help turn back the clock. Our eyes are the windows to our soul, showing expression and emotion. But as we grow older, the area around our eyes can make us look tired, angry, wrinkled or puffy. Bulges, skin excess and fullness are also common. Changes of ageing involve skin, muscle and fat layers. In the lower eyelids – a structural, supportive layer – the orbital septum also bulges with time. This allows the deeper fatty pouches to protrude forward, resulting in puffiness or bulging of the lower eyelids. Each of these layers need to be addressed in the correction. A thorough examination determines the contribution of each layer and correction may involve each or all of these layers. It is also important to balance both the upper and lower eyelids. Correcting only the upper lids may make the lower eyelids appear worse. Drooping or ptosis of the eyebrows may contribute extra skin to the upper eyelids. Eyebrow position, in resting state, must be assessed. Lazy eyelids or low upper eyelid position may overlap the colour portion of the eye. This can also be corrected. After a full medical history, a complete examination of each of the eyelid layers is performed. Upper, middle and lower divisions of the face are also assessed. Any abnormal findings may prompt further investigation. Multiple photographs document the eyelids from frontal, oblique and side views. These also help with planning of surgery. Most surgeons will show photographs of the surgery, recovery and likely outcomes. Handouts are useful references to keep. There are risks associated all surgery and these should be fully understood. Incisions are planned so the resultant scars are well hidden. An ellipse of skin is removed from the upper lids. This may extend out to the crows feet where many people have extra skin or lateral hooding. Underlying strips of muscle may be removed. Fatty tissue from the medial or middle part of the upper lids may also be removed. Careful control of bleeding points and stitching completes the surgery. Placing the lower incision just below the eyelash line hides the resultant scar. Muscle is left on the lower eyelid to support the position of the eyelid. Lower down access is gained to the deeper tissues. Close to the junction of the orbital septum and cheekbone, the fatty tissue is conservatively removed. The supporting septum is then repaired. Fatty tissue may be repositioned to prevent hollowness. Very little skin is removed from the lower eyelids. In general, the lower eyelids are under-corrected. During the healing period, temporary dissolving stitches may be used to support the lower lids. Depending on how much tissue needs to be corrected, the surgery can be performed in the rooms under local anaesthetic or in a hospital or day-surgery with general anaesthetic. Local anaesthetic contains adrenaline which causes small blood vessels to contract – this helps limit the bleeding and bruising. It is possible to go home the same day as surgery although some close to stay overnight. Many surgeons use cool packs to help with swelling and bruising. Using local anaesthetic also means a number of pain-free hours after the surgery. In general the surgery is not considered too painful. Regular reviews are completed after surgery. Advice on wound care, scar management, lid massage and healing is important. Most swelling and bruising has settled by two weeks. Some swelling and dryness may persist longer. A gradual return to full activities is encouraged. Return to sport and exercise is dependent on recovery rates. Generally the surgery is well tolerated with favourable outcomes.